JetVideo is a video player compatible with a wide range of formats such as AVI, MPEG, and many others. It contains several features to provide the best quality when playing videos. 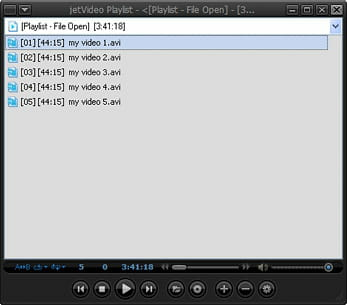 Playback: JetVideo's main function is to read videos regardless of their format. It incorporates all standard buttons necessary to perform this action including Play, Pause as well as Next or Previous. Playlist: it is possible to prioritize the favorite videos with this program. Indeed, the user can create a playlist and save it for later use. It has also a library function that displays all video contained in the hard disc. Subtitles: with JetVideo, the user is able to load subtitles for the current video. It supports various formats such as PSB, USF, SMI and still many others. It has an option to adjust the position, font and transparency of these elements. JetVideo supports full screen mode. The user can also change the appearance using built-in skins. It supports most popular video formats MPEG, AVI, DIVX and many others. Latest update on March 5, 2015 at 12:37 AM.